The New Mk7 Fiesta Zetec (and USA Spec 2011) can benefit no end from the upgrading of the brakes. The front brakes are the most important as they give over 75% of the main stopping power. 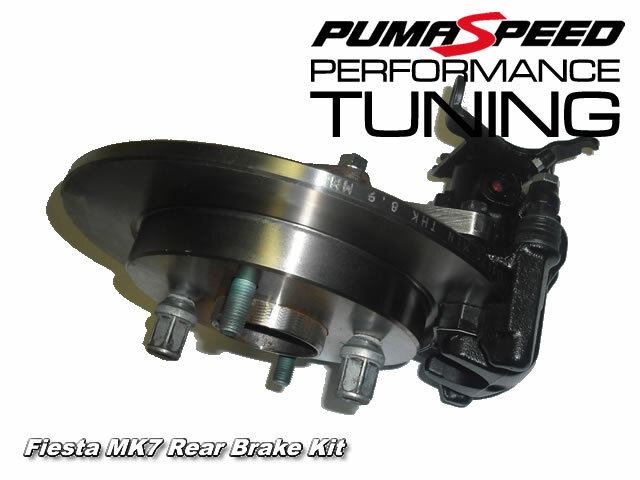 For Front brakes Pumaspeed recommend Mintex M1144 pads. The new Pumaspeed Rear Disc Conversion has been tested on the ken Block Replica for over 12500 miles and is now ready for Sale to the public. All Nuts Bolts and fasteners to enable direct fitting. Get yourself in the queue for this eagerly awaited kit by putting your name down for the first batch. Fiesta Mk7 Rear Disc Conversion? The Pumaspeed Workshop team are ready to fit the Rear Disc Brake Conversion kit in our Head Office located here. We estimate the labour time to be approximately 3.75 hour(s) costing £292.50 inc VAT. Therefore making parts and labour a total cost £842.48 (inc. VAT). Pumaspeed have a specialist distribution team that can dispatch the Rear Disc Brake Conversion kit to any destination worldwide.